Independent Life Care Services, Inc., (ILCS), Supported Living Services (SLS), are available to adults with developmental disabilities who receive services from the Regional Center of Orange County (RCOC) AND want to live independently in their own home in the community. Individuals receive individualized services that are consistent with their desires and needs and in alignment with their Individualized Program Plan (IPP). Independent Life Care Services, Inc., Supported Living Services supports independence and empowerment to maximize opportunities and choices for living, working, learning and recreation in their communities. Independent Life Care Services, Inc. is dedicated to delivering quality services, which stress human dignity, humane care and individual choice to enable the individual to live as independently as possible. To request Supported Living Services, contact your Regional Center Service Coordinator. You may not receive Supported Living Service while you are living at home with a parent, but you may receive Transitional Supported Living Services to help you find a place and move into your own home, at which time Supported Living Services will assist the individual with maintaining their independent lifestyle. 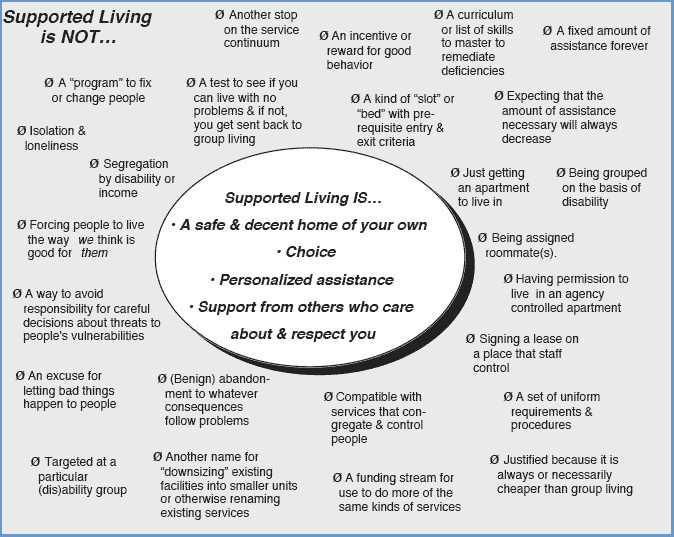 What are Supported Living Services? Supported Living Services (SLS) consist of a broad range of services to adults with developmental disabilities who, through the Individual Program Plan (IPP) process, choose to live in homes they themselves own or lease in the community. These services help individuals exercise meaningful choice and control in their daily lives, including where and with whom to live. SLS is designed to foster individuals' nurturing relationships, full membership in the community, and work toward their long-range personal goals. Because these may be life-long concerns, Supported Living Services are offered for as long and as often as needed, with the flexibility required to meet a persons' changing needs over time, and without regard solely to the level of disability. Typically, a supported living service agency works with the individual to establish and maintain a safe, stable, and independent life in his or her own home. The guiding principles of SLS are set down in Section 4689(a) of the Lanternman Act. The California Department of Developmental Services regulations for SLS are found in Title 17, Division 2, Chapter 3, Subchapter 19 (Sections 58600 et seq) of the California Code of Regulations (CCR). 24-hour emergency assistance, including direct service in response to calls for assistance. This service also includes assisting and facilitating the consumer's efforts to acquire, use, and maintain devices needed to summon immediate assistance when threats to health, safety, and well-being occur. Methods of service delivery will vary with each individual; services and supports will change as individuals change. Ongoing assessments and evaluations will be made to identify the individual's changing needs and dreams. The Lanterman Developmental Disabilities Services Act (people also call it the Lanterman Act, for short) was passed in 1969. This is the California law that says people with developmental disabilities and their families have a right to get the services and supports they need to live like people who don't have disabilities. The desire to have personal control over our lives is a value that we all share. The Lanterman Developmental Disabilities Act (Lanterman Act) underscores the importance of this commonly held value by stating that individuals (and where appropriate, their parents, legal guardian, or conservator) "…should participate in decisions affecting their own lives, including, but not limited to, where and with whom they live, their relationships with people in their community, the way in which they spend their time, including education, employment, and leisure, and the pursuit of their own personal future, and program planning and implementation." The people who wrote the Lanterman Act set up organizations called REGIONAL CENTERS to help people with developmental disabilities get the help they need. The Regional Centers refer to the individuals they serve as "consumers". The Lanterman Act has the rules about how the regional centers can help their consumers. In California, many services for people with a developmental disability are coordinated through a network of twenty-one, non-profit Regional Centers established by the Lanterman Act. If a person is eligible, regional centers provide planning and related services including service coordination. Service Coordinators help individuals and families with information, guidance, and assistance in accessing and using appropriate generic services and natural supports. If the service is related to the person's developmental disability and is included on the Individual Program Plan, (the IPP is developed by an individual and his/her Service Coordinator. It states the goals that an individual is trying to achieve and the services and supports needed to reach those goals), a regional center may purchase the service from an approved service provider.